Hotel Jakarta Amsterdam is a unique sustainable hotel in Amsterdam at the IJ river, at the former location where ships left for Jakarta. This is a gorgeous place with stylish rooms and a great spa + swimming pool. The ambience is serene and replenishing. The interior design throughout the entire building is a sight to behold for those who like modern / minimalist furnishing. Located within a 6-minute walk of Rembrandt House and 600 yards of Dutch National Opera & Ballet, Motel One Amsterdam-Waterlooplein in Amsterdam provides a bar and rooms with free WiFi. Very nice facilities and in walking distance to the center of the city. Located in Amsterdam, 1640 feet from Basilica of St. Nicholas, The Hendrick's Hotel has a number of amenities including a bar and fireplace in the shared lounge and free WiFi. Walking distance to many places. Very clean room in an historic building. Friendly & helpful staff. The QO is located alongside the Amstel river in Amsterdam. This hotel combines luxury, technology and sustainability in a living building shaped by nature. The hotel was close to the Subway, breakfast was very good, hotel is very modern and the staff was extremely polite and helpful. This 4-star design hotel is located in the historic center of Amsterdam. V Nesplein offers stylish rooms with free WiFi and a restaurant. Central Station is 2789 feet away. The room had enough space for two,hot water all time long(we visited in January). Located in the heart the canal belt, lifestyle hotel Andaz Amsterdam Prinsengracht - a concept by Hyatt offers elegant design rooms with free Wi-Fi. The staff was super friendly and accommodating! Set within 25 interlinked 17th and 18th century canal houses, the newly restored Pulitzer Amsterdam is a luxury hotel along the famous Prinsengracht and Keizersgracht canals. Probably the best hotel i’v ever been to. Located in Amsterdam, 1640 feet from Basilica of St. Nicholas, The Hendrick's Hotel has a number of amenities including a bar and fireplace in the shared lounge and free WiFi. Walking distance to many places. Very clean room in an historic building. Located in Amsterdam, next to Amsterdam Amstel train station, MEININGER Hotel Amsterdam Amstel provides accommodations with a bar. Metro, bus and trains near the hotel. Set in Amsterdam, Park Inn by Radisson Amsterdam City West offers unique accommodations in the VEN mixed-use complex. Breakfast, location and big room. The staffs were very friendly and helpful. Right in the heart of the city overlooking the Royal Palace, the National Monument on Dam Square and the Rokin, you will find Hotel TwentySeven. All details are taken into consideration. High tech systems. Staff are super l excellent. Located near the famous 9 Straatjes shopping district, Hotel IX Nine Streets Amsterdam is located in Amsterdam. Free WiFi access is available here. Space inside was awesome!!! Location even better!!! The Hoxton, Amsterdam, made up of 5 canal houses, offers accommodations in Amsterdam and features free WiFi and a restaurant. The rooms are equipped with a flat-screen TV with cable channels. everything. comforatable atmosphere, service, location, everything. Hotel Estheréa is set along the Singel canal in the center of Amsterdam, only 984 feet from Dam Square. This hotel is in a quiet area and benefits from classically-styled decor with wooden paneling. Perfect location, and great service and staff! Which hotels in Amsterdam offer an especially good breakfast? For hotels in Amsterdam that serve highly-rated breakfasts, try Hotel Jakarta Amsterdam, Hotel V Fizeaustraat, and Ambassade Hotel. Which hotels in Amsterdam have nice views? Hotel TwentySeven - Small Luxury Hotels of the World, Hotel Jakarta Amsterdam, and Sir Adam Hotel got great room view-related reviews from travelers in Amsterdam. Which hotels in Amsterdam are good for couples? These hotels in Amsterdam are highly rated by couples: Hotel TwentySeven - Small Luxury Hotels of the World, Hotel IX Nine Streets Amsterdam, and The Hendrick's Hotel. On average, it costs $121 per night to book a 3-star hotel in Amsterdam for tonight. You'll pay around $160 if you choose to stay in a 4-star hotel tonight, while a 5-star hotel in Amsterdam will cost around $385, on average (based on Booking.com prices). 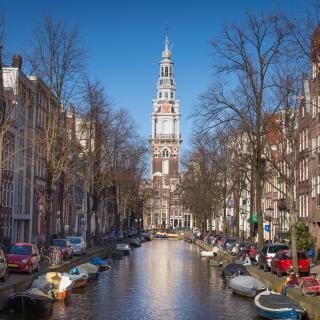 Many families visiting Amsterdam loved staying at Park Mansion Centre, Pillows Anna van den Vondel Amsterdam, and Hotel IX Nine Streets Amsterdam. The average price per night for a 3-star hotel in Amsterdam this weekend is $387 or, for a 4-star hotel, $442. Looking for something even fancier? 5-star hotels in Amsterdam for this weekend cost around $1,143 per night, on average (based on Booking.com prices). Travelers who stayed in Amsterdam near Schiphol Airport (AMS) have said good things about YOTELAIR Amsterdam Schiphol Transit Hotel, Sheraton Amsterdam Airport Schiphol, and Mercure Hotel Schiphol Terminal. 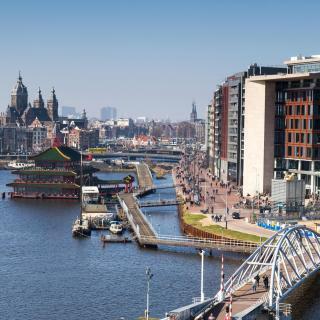 Which hotels are the best ones to stay at in Amsterdam? Hotel Sebastians, The Hendrick's Hotel, and Ambassade Hotel are some of the popular hotels in Amsterdam. 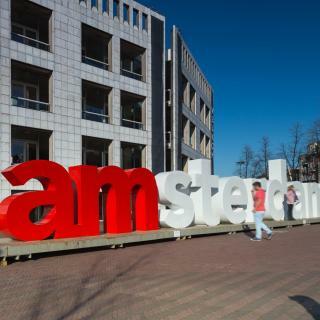 On average, 3-star hotels in Amsterdam cost $135 per night, and 4-star hotels in Amsterdam are $172 per night. If you're looking for something really special, a 5-star hotel in Amsterdam can be found for $166 per night, on average (based on Booking.com prices). 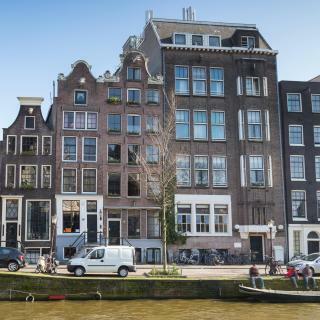 Which neighborhood is the best one to stay at in Amsterdam? Amsterdam City Center, Amsterdam Noord, and Oud Zuid are popular with other travelers visiting Amsterdam. One of my favourite cities to enjoy by walking around and enjoying a coffee or beer on a patio by the canal. Anne Frank's House is very touching. A fun accommodation option is to sleep on one of the many boat hotels (docked in front of NEMO, about 15 min walk from Central Station). Very touristy in the summer - a nice spring or autumn city break. Fantastic, fun city that has something for everyone! Fantastic, fun city that has something for everyone! I personally love the art museums the best. But it's also a great place for walking during the day or night, trying different eateries, browsing the shops, trying daytrips to Alkmaar or Haarlem via the train station... We personally liked going to Albert Heijn market and getting cheese, bread, fruit and yogurt and eating in our hotel room. You can save a lot of money that way. 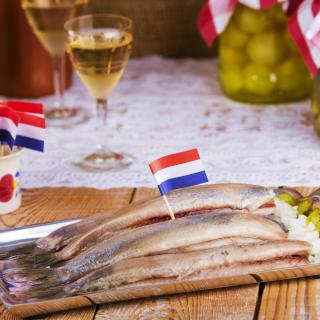 Another good thing to try is raw "haring" (herring) form one of the herring carts. They serve it with diced onions and pickles on a bun. If you like sushi, you'll love it: it's delicious, with a clean taste like the ocean, and it's not at all fishy. You can also try riding the tram. If you purchase an OV-chip card, it's easy to just scan it when you go on and off the tram. If you stay in d'Amsterdam Hotel, Leidse Square is very close, and the trams to the train station can be caught there. Totally POOR services with unfair delivery of a double room but it was a twin bedding? Sleepless nights. Faulty toilet door and shower bar? With calls and hand written note of constructive feedback but without recovery, with only blaming game. 1) Part-timer 2) Chamber Maid's job. No immediate repair was done after the hand written note presented after a compelling sleepless night. With photographs support on the redress/recovery claims to be followed. I swear, it is my most disappointed trip to Amsterdam. I live in the Netherlands and go to Amsterdam quite often in order to attend various parties, so it isn't an exotic place for me. The koffieshops and souvenirs shops every twenty meters are kind of ridiculous, obviously targeting the tourists who come here just for the weed; if you don't care you may find it somewhat pathetic. I had a great time shopping there, as there are many places to find alternative/gothic/fetish clothes and accessories (look up Demask), in addition to more mainstream shops that cannot be found in my hometown. Restaurants are a bit expensive, more than in the rest of the country, and the quality isn't that great. So don't look too closely at your wallet, just treat yourself. Now, if you're on a tight budget, you might want to visit Utrecht instead of Amsterdam. Traffic is a mess. Cars, bikes, tramways and pedestrians all try to figure out how to move in this maze of narrow streets. Be careful, and don't even try driving; take the tram or walk, nothing's very far, it's not that big of a town. Book your hotel rooms as early as you can; I made the mistake once of thinking I could just find a place to stay on the same day, and ended up paying 200 € cash for a room without toilets or shower. I haven't visited any of the museums yet, so I'll have to go back soon. The city is crowded with tourists in August and the lines to museums are very long. We would have liked to see the Van Gogh Museum and the Anne Franke House but didn't want to wait the two to three hours in the ticket line. If you pre-book tickets online, it will be faster. (But there is no pre-booking for Anne Frank, we tried booking a month ahead, as that is the limit, but tickets were all gone. )The Rijksmuseum was easy to get into without pre-booking. Enjoyed touring the Heineken Brewery and the hop-on, hop-off canal boat tours. (You can get a free canal tour with your Heineken ticket and also a free visit to the observation tower.) The Red Light district is noisy all night, so in hotel rooms there, without AC and windows open, don't expect to get much sleep. Reception staff are all super nice and helpful. The location is super convenient, metro station is just around the corner.